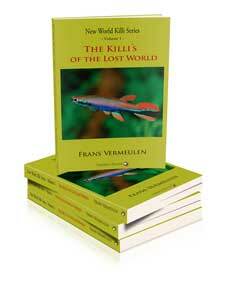 The first book in a series of 4 with the title "The Killi's of the Lost World" is published. You can order the book by sending an e-mail to: vermeulen@setarnet.aw or send a request to me by the use of the "contact" form at the top of this page. Welcome to "It Rains Fishes". Frans Vermeulen, a Dutchman on Aruba who created and maintains the site, is glad you have visited and hopes that you will find the information it contains both useful and of value to you. All areas of the site are accessible, without need for any registration or membership. The site is intended for hobbyists and scientists alike who would like to know more about the Killifishes of Middle and South America. It follows the most recent views in nomenclature as presented by Dr. Jean Huber in "Killi-Data Online". Information has also been derived from such literature as "A World of Killies" by R.H. Wildekamp and "New World Killies" by the late Dr. L. Seegers. Additionally, historical and contemporary manuscripts, and publications from scientists from all over the world have been consulted as further sources of information. The name of the site, “It Rains Fishes,” is based upon the folklore of indigenous Indian tribes. This "event" was their explanation of the truly natural wonder of juvenile fishes appearing, often within an hour after the first seasonal rains, where there had been no water, and certainly no fish, for long periods of time. At the left column of each page, you will find listed most genera of the Killies inhabiting South- and Middle America. Additional genera will be added as time goes by and events warrant. By clicking your mouse on a genus name, access to an introduction page of the genus and a list of the species it contains will appear. Species names followed by an asterisk are considered defunct, but have been retained for ease of search. Moving your mouse and clicking on "introduction" or a species' name will cause the appropriate information to appear. If a genus name in the left side menu is underlined it contains a number of subgenera names assigned to that genus. Often these subgeneric names are circulating or considered to be full genus names but these changes are not followed herein. Within the information pages, clicking on images will enlarge them and also provide information about the content of the image and the name of the author or source. Clicking the image again will shrink the image back to it's normal size. Menu's at the top of the species pages will take you to the indicated type of information, such as a short history, information on reproduction and breeding of the species, interactive maps, available images of the species' habitat and known variations of the species, meristics, publications, etc. If literature is freely available online, a blue "PDF" symbol will be present, and you can download/open it in a new window by clicking on the symbol. At the top of the mainpage, links give access to the other sections of this site. For example, you may have an interest in the field trips I have made in attempts to locate known species, but also new undescribed species in their habitats. For that example there is a link called <Expeditions> . You may also have questions not answered in the site, or comments you wish to send to me. You might also like to help me make the site more comprehensive by providing PDF files containing additional general information, species information, images of species or population variations, images of biotopes, or publications of which I may not be aware. For any of the above, please e-mail me by selecting the <Contact me> link and I will respond promptly. There are many biogeographic areas which do not have sufficient rainfall throughout the year to support aquatic life. As a result, some fish habitats totally evaporate on a seasonal cycle. Many of the Rivuline lineages have adapted to this cycle and developed a remarkable annual lifestyle that overcomes this environment. Imagine; these genera have become capable of surviving dry periods by producing eggs that can survive in the bottom layer of the semi-moist soil of their environments. If the water evaporates, the eggs remain viable, and the population will re-inhabit these temporary waters through the hatching of their offspring once the rains appear. Obviously, these species must grow extremely fast to become adults, often within several weeks or months, and start reproducing rapidly in order to survive as a species when the waters recede again. Each dry season can last several months, and in some locations, occasionally more than a year. In the last decade, numerous species which were included in a single genus have been split into several genera by scientists. This was a result of the need to provide a clearer view of the different lineages in these fishes and their evolutionary paths. A great number of the newer genera were erected by the Brazilian scientist, Dr. Wilson Costa. The oldest known are Adinia, Austrofundulus, Cualac, Cubanichthys, Cynolebias, Cynopoecilus, Fluviphylax, Garmanella, Hubbsichthys, Jordanella, Leptolebias, Leptolucania, Lucania, Moema, Orestias, Pterolebias, Rachovia, Rivulus, Simpsonichthys, Terranatos and Trigonectes. Many of them are now divided into several other genera. More recent erected genera are Aphyolebias Costa 1998, Austrolebias Costa 1998, Campellolebias Costa et al. 1989, Gnatholebias Costa 1998, Kryptolebias Costa 2004, Llanolebias Hrbek & Taphorn, Maratecoara Costa 1995, Megalebias Costa 1998, Micromoema Costa 1998, Millerichthys Costa 1995, Nematolebias Costa 2002, Neofundulus Costa 1998, Papiliolebias Costa 1998, Pituna Costa 1989, Plesiolebias Costa 1989, Renova Thomerson & Taphorn 1995, Simpsonichthys Costa 1996, Spectrolebias Costa & Nielson 1997 and Stenolebias Costa 1995. Some relative new annual genera are Hypsolebias, Ophthalmolebias, by Costa in 2011 and Yssolebias 2012 by Huber. Also in 2011 Costa proposed a re-ordening of the genus Rivulus and he devided the genus into 6 new genera, most of them former sub-genera, and left the genus Rivulus with only 3 taxa remaining. The 6 genus names then were Anablepsoides, Atlantirivulus, Cynodonichthys, Laimosemion Melanorivulus and Rivulus. Huber (2012) published a paper which was, based on a wider array of meristic evidence only. Huber explained in his paper that Costa's move was premature and not well supported by the mitochondrial, meristic and osteological data Costa combined. In this site we are approaching the issue conservatively and follow the latest evidence provided by Huber (2011) which means that the genus Rivulus is still seen as a monophyletic assemblage with a number of subgenera or even species groups. You can search for all subgenera under the Rivulus SS menu tag and find there the taxa assigned to each subgenus. In 2014 Costa did introduce the new genus name Xenurolebias for two species that were known as Simpsonichthys myersi and S. izecksohni and added 2 new species to that genus. In 2014 Costa erected then the monotypic genus Mucurilebias for the taxon known so far as Leptolebias leitaoi. Surprisingly Costa (2014) considered the genus Aphyolebias, a genus which was erecte by himself earlier, to be synonym to Moema. Most remarcable however the synonymisation of Rachovia to the older Austrofundulus. Costa (2014) lumped these genera to one genus now Austrofundulus. This move is strange and discussed as so often his moves were discussed in the past. Time will tell if this is a move that will stand. Recent DNA study revealed the need to "re-shuffle" the grouping of the subgenera within the genus Austrolebias which is conducted by a group of young scientists from Brazil. This outcome is not congruent with the former classification and this research is a still ongoing.